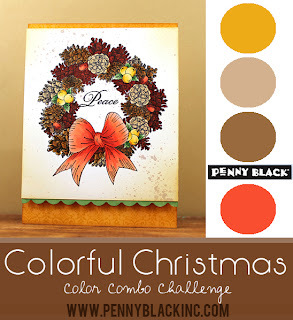 We are on Day 5 of the Color Combo Challenge at Penny Black...have you played along yet? Click on the banner below for the challenge color combos and how to enter your projects to win FREE stamps. Who doesn't like free?!? Today's colors reminded me of a paint chip I had stashed in a drawer. The funny thing is that Nancy over at Operation Write Home did a post on paint chips this week that made me laugh. The link to the blog post is here. (go on ...you will laugh too, because I know you are going to feel the same as her about this subject). And of course I am entering this card into her challenge at OWH. I used a paint chip as my card base, rounded the corners and heat embossed over the "paint names". Stamped, colored and fussy cut the large flower. The flowers are Petal Party (30-113) and the sentiment is from the Sentimental (30-176) set. You have until September 27th to play in the challenge...go, go get started and get those projects in. I would love to welcome some new friends to the blog this week. I so appreciate you taking the time to visit, comment and follow what I am doing. A happy weekend to everyone !!! This is such a lovely card and what a great and creative idea to use the paint chip!! I love clicking on your blog and seeing what you do next!! Beautiful, Penny, using my fave flower! You should also enter this into the Simon Says Stamp Wednesday challenge: embossing. Such a great take on the colour challenge, Penny! Beautiful design! 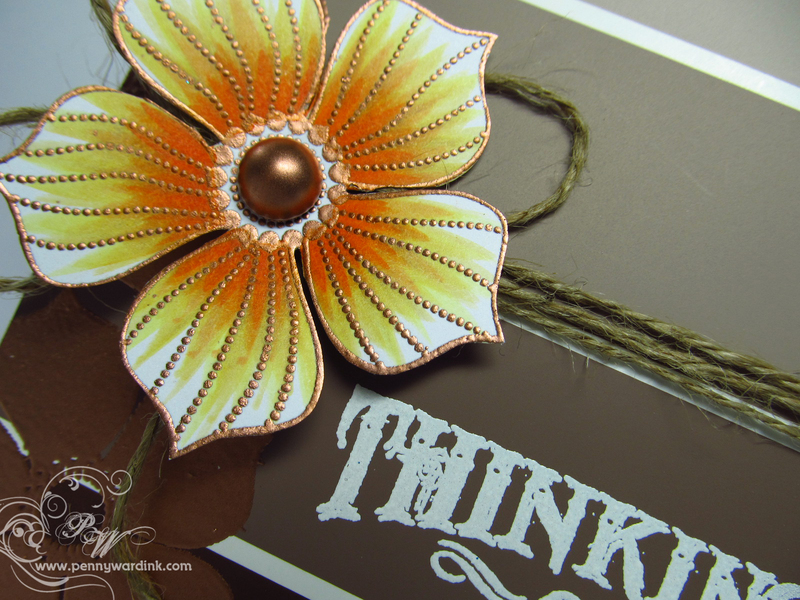 really cool take on the color combo, penny... love the embossed flowers! Wow, Penny! Your paint chip card is fabulous!! Penny, This is such a pretty card! Love the palette and the embossing on the flowers. Gorgeous, and the flower is quite the eye catcher! Oh how fun! I love your paint chip card! That flower is gorgeous :) thanks for all you do!!! And for playing along with the tutorial!